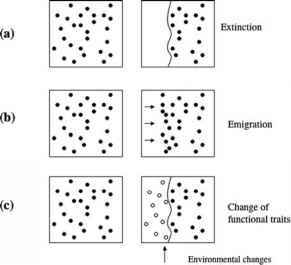 When a species encounters by chance new environmental conditions three types of responses can occur according to the type of environmental constraint: extinction, geographical displacement, or adaptation. If the modification occurs quickly and produces an abrupt change in environmental conditions, such as the water table, pH, or salinity, or when an acute pollution event occurs, then individuals may become extinct. If the modification occurs gradually and the organism has the capacity to compensate or to displace itself (this case is restricted to animals), the individuals can move, searching for a new favorable locality. 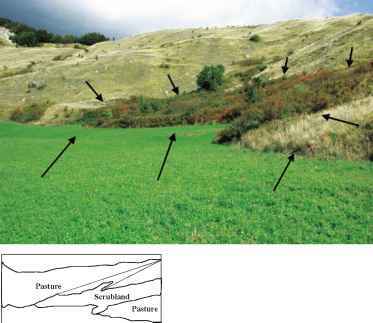 Finally, if the change is not dramatic, individuals can "recalculate" the quality of one or more of the eco-fields, and can self-maintain in the same location (Fig. 8.10). Fig. 8.10 Three possible mechanisms of changes at population resolution of individual reaction to environmental changes. (a) A sudden stress moves to extinction a portion of the population. (b) Changes are important but the organisms have time (energy) to displace (this case is restricted to mobile organisms). (c) The environmental change is not so dramatic and organisms can modify an eco-field over time and maintain at the same time the original position in the living area. A combination of these three possibilities is a realistic mechanism mechanisms of organisms, and it is a mechanism that greatly contributes to the creation of the ecological debt (sensu Tilman et al. 1994). This last strategy acts as a redistribution of information among the different eco-fields, exposing species to different levels of environmental constraints. For example, there is the well-known process of phylopatry by which a species persists in an area that has lost most of the favorable characteristics for this particular species. This phenomenon can be explained using the eco-field paradigm in which the fidelity to the natal area has a higher score than the eco-fields related to resources. On the other hand, the phenotypic plasticity is evidence of the capacity of each eco-field to contribute to the stability of individuals and populations in a selected area. The eco-field paradigm can also be applied to an aggregate system, such as a patch, or a mosaic. It can describe the spatial distribution of an emergent property of the system, such as resilience, stability, resistance, etc. From this principle it is possible to track backward the effects of environmental changes. In this way, assuming a central place model applied to a forest, the more resilient parts of a forest are the borders, and any change at the border presumably is better buffered than changes in the center of the forest. This is possible if we consider the presence of an active mechanism of adaptation. A snowstorm damages to a greater extent the interior of a beech forest than the border. This is evident because the border plants have a higher probability to be disturbed by external events, such as wind and snowstorms, than interior plants which are better protected by their numerosity. At the border, plants have trunks that are highly modified by adverse events, and their shape is twisted and, consequently, more resistant to further physical stresses.